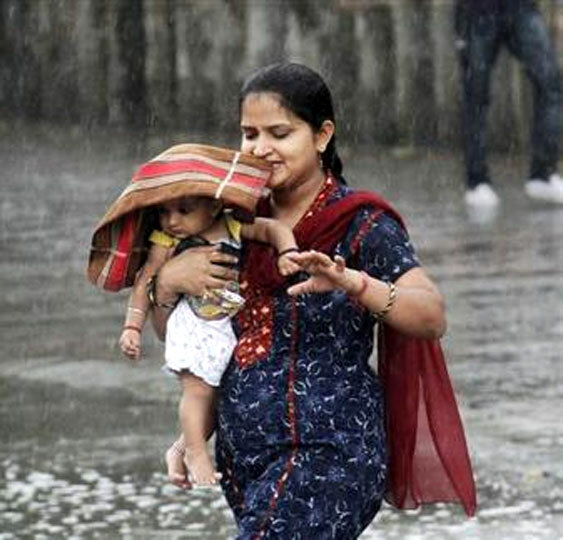 Rediff.com » Business » Monsoon worries: is India ready? Monsoon worries: is India ready? Vikas Chaudhary, a farmer in Haryana's Karnal district, started using a maize planter in 2012. The acquisition of a happy seeder around the same time helped him sow wheat directly. The two machines helped him reduce input costs substantially. "With the help of machines, I have managed to reduce the input cost for paddy by Rs 2,000 an acre, for wheat by Rs 2,500 and for moong by Rs 1,000. The labour requirement, too, has come down by at least 15 per cent," says Chaudhary sipping orange juice in his office adjoining his sprawling farm on a hot Sunday afternoon. Chaudhary' acquisitions include a happy seeder, a zero till drill, a laser leveller, a maize planter and, recently, a green seeker. The last one provides information about the amount of urea needed on a particular piece of land depending on the crop sown. Vikas is not alone in using machines to cut costs and raise productivity on his farm. Farmers in many villages of Karnal district say adoption of machines like the laser leveller, zero till drill and happy seeder is rising every year. "The laser leveller has been an instant hit. It reduces water requirement by 30 per cent. "On top of that, if we use the happy seeder and the zero till drill, the water requirement drops even further. These are the only things we can do to reduce our dependency," says Jagmohan Singh, a farmer of Pujam village. Unlike neighbouring Punjab, Haryana has been late in mechanising its farms, but the trend is picking up. Labour shortage and threat of deficient monsoons are pushing the adoption of farm machinery. In Punjab mechanisation is driven by village cooperative societies, but rich farmers are driving the change in Haryana. "Our village had just one happy seeder. I expect the number to touch five this year. The adoption of machines is slow, but it is catching up," says Chaudhary. Machines are not the only change visible in Haryana's farms. Farmers say they are choosing crops that need less water. This area is known for growing paddy and basmati used to be a favourite variety for most farmers. "Most farmers are going in for parimal and other varieties of rice this year. "The steep fall in prices of basmati last year is a factor. "Other varieties need less water and grow faster. This helped me make up my mind," says Harjit Singh, brother of the village sarpanch of Nilokheri village. Popular varieties likely to be sown this year include PR 123, 124 and 359. They are ready for harvesting within 100 days where basmati takes at least 120 days. Non-basmati varieties also need 25 per cent less water. Some farmers are betting on growing maize, which needs even less water, and the harvesting time is 70-80 days. Farmers of Haryana and other wheat growing states suffered because of unseasonal rain in March-April. According to estimates, 1.95 million hectares out of the total of 2.5 million hectares of land in the state suffered some damage due to rain and hailstorms. Following last year's deficient monsoon, the damage to the rabi crop has made farmers despondent. "I am a Pathan, I know how to collect dues. Farmers come here for seeds and pesticides on credit. "I cannot say no to them yet I know many of them will take months to pay me," says a trader who owns a shop on the outskirts of Nilokheri town. He does not wish to be named as he belongs to an influential political party of the state. "Land prices in and around this area have fallen by 40-50 per cent in the last one year. "There is little farmers can do to deal with the weather. Unless the issue of farmers' indebtedness is addressed, I see no hope for farmers in this region," he adds. As the kharif season is about to get under way, there is only a trickle of farmers at his shop to buy seeds and pesticides. Farmers are, however, hopeful of tiding over the monsoon woes with a mix of crop diversification and increased machine use. They are also expecting higher government-announced minimum support prices. "The government must raise the MSP for rice this year," says Harjit Singh. Monsoon mystics: Who trusts the IMD's weather forecast?